When you’re describing a truffle, it’s hard to make them sound particularly exotic. They look something like a clod of dirt, a knot of dark wood that’s been kicked around a bit, or an egg gone seriously awry. And yet, they are one of the most prized foodstuffs on the planet. Traditionally, they were just as valuable. In Ancient Egypt they were eaten after being covered in goose fat. The Greeks credited them with supernatural powers of healing. And the medieval church went so far as to outlaw truffles, crediting their pungent aroma to the devil’s work. Technically, the food that’s causing all this fuss is a fungus. Truffles are a truly wild food, found in the roots of trees - their cultivation can be encouraged through the scattering of spores and the planting of certain trees, but not controlled. Truffles come in both white and black, with the even rarer white truffles reaching a higher price. Australia’s movement into truffles has created a second truffle season internationally, a move which has been appreciated by gourmands worldwide. Australian truffle farmers or growers have planted oak and hazelnut trees to encourage truffles to grow and taken tips from the developed European truffle culture. We’ve also done a few things differently, of course. Traditionally, pigs were used to find truffles, as they would get excited by the aroma and lead the hunters to it. But pigs were also reluctant to give up their finds, so it wasn’t unusual for the truffle hunter to be missing a finger or two. In Australia, sensibly, dogs are trained to find the truffles. Truffles are now a real thing down under, and in the food mecca of Melbourne, there’s even a yearly festival devoted to all things truffle, where fans can enjoy degustation dinners, buy their own truffles to use at home, and even join in a truffle hunt. 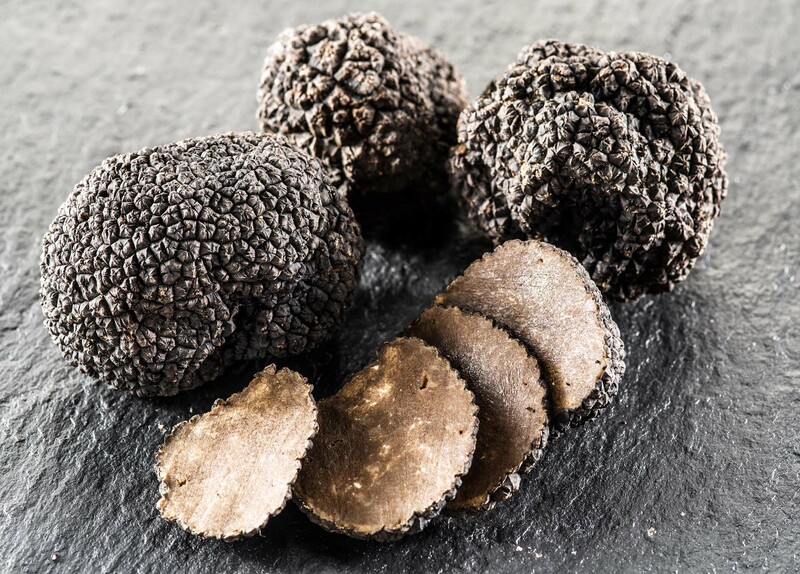 We spoke to Nigel Wood, the Director of Truffle Melbourne, to discover more about the appeal of these valuable nuggets. "Cut up your truffle and mix through softened butter, then roll into a log in cling wrap. You can freeze any leftovers and use it on next week’s steak or stir through a pasta." What makes Australia such a great place to cultivate truffles? Our soils don’t contain some of the truffle’s naturally occurring fungal competitors, which are found in Europe’s natural forests. Plus many places across Australia have the high summer and cool winter climate that culinary French Black Winter truffles enjoy in their native environment. What should you look for when you’re buying a truffle? You want a firm truffle with a strong aroma. If it’s not firm it’s probably over ripe, but it’s the aroma that’s the main attraction. Your truffle’s aroma should complement the simple or more sophisticated ingredients and dishes you’re planning. How much should you expect to pay for a truffle? Truffles generally retail for around $2.50 per gram. I recommend 3 to 8 grams per person per dish. 3 for canapes, and more for your main and desert dishes. So for a three-course dinner party for four, you might spend $60 – about the same as the wines you’ll enjoy over dinner. Truffles are notoriously difficult to cultivate, time consuming to harvest and expensive to grade – so these costs all add up. There are cheaper options out there though - truffle oil, even potato chips. So, if a food is ‘truffled’ does it contain truffles? We’ve come a long way from when I started Truffle Melbourne in 2014. At that time I was often asked about chocolate truffles. Now truffles are becoming mainstream with major brands offering truffle burgers, fries, pizzas or chips. These of course contain truffle essence and so have never seen a real truffle in their life, but some are subtle and a great way to extend your truffle season to 365 days a year. How do truffle ‘grades’ work? There are several grades for truffle. Extra class are well shaped truffles with great aroma, used for shaving on dishes. First class truffle also have superb aroma, but are not so pretty! They will have a few small cuts but are still great for shaving and any use. Second class truffle must also have great perfume. These are often used as a base for dishes – perfect for making sauces, blitzing into a soup or an ice cream, or making truffle butter at home. Hang on, how do you make truffle butter? It’s simple, cut up your truffle and mix through softened butter, then roll into a log in cling wrap. You can then freeze any leftovers and use it on next week’s steak or stir through a pasta. It’s an easy way of preserving fresh truffle at home. Any other truffle tricks we should know? When you get your truffle home, store it alongside some fresh eggs in a container in the fridge. Leave them for a day or two and the scent of the truffle will infuse the egg yolk, so you can enjoy truffled scrambled eggs for breakfast. As always, a little truffle goes a long way. Find out more at Truffle Melbourne. Does fasting really help with inflammation?